Sometimes you can find some gems when you dig into the patent system. One thing I like about the holiday season is that it gives me the opportunity to be a little less formal and have a little fun. I find humor within the patent system. I can remember growing up and being told that our next-door neighbor was crazy—but brilliant because he had a patent. Everyone looked to him as though he was a technology god. Later in life I learned how easy it is to get a patent, especially if you have a corporate backer. Don’t get me wrong, there are a lot of very bright people out there and many patents that are brilliant and exactly what the patent system was intended for. There are also a lot of patents that are close to being jokes. I guess the patent lawyer forgot to proof read before filing! This patent did not get approved. People who have cats are always finding new ways to play with them. It didn’t take people long to realize that laser pointers were a great way to drive your cat crazy without having to get anywhere close to claws – a problem that pertains to many other ways of playing with cats. 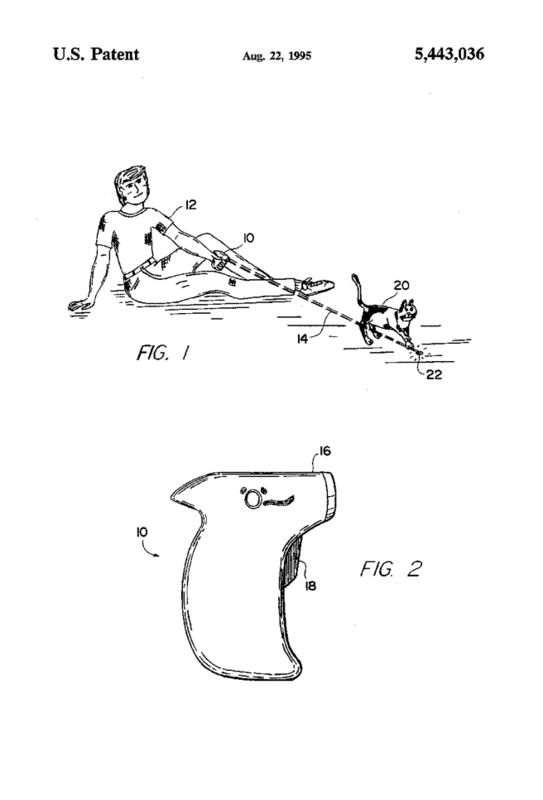 But before you do that, you may want to apply for a license to patent US5443036A – Method of exercising a cat. Let me help you understand how this works. The involuntary and almost imperceptibly slight movements of the hand holding the laser device of the present invention creates a jittery animated effect in the light pattern at the opaque intersection appealing to cats even when the device is held essentially steady. It would appear that the USPTO sometimes has a very low bar when it comes to being novel and non-obvious. So, cat owners – you have been warned. Patent applications can be a little wacky but overall I believe that the patent office is doing a good job of helping individuals obtain patents. This week my latest patent application, Processing Circuits for Parallel Asynchronous Modeling and Execution, was allowed and will be published in less than four weeks. I am 71 years old and the patent office offers an accelerated review, for an extra fee, for individuals over 64 years old. My other patents (US 4,852,047, US 6,421,821, US 9,003,383) took between two and three years to issue, this one happen in approximately six months. This is important to older inventors like me. Hmm, your business method example is not completely bogus. Maybe not patent-able, but the underlying idea is something I was cautioned about years ago. If you make a product with secret parts, placing your faith in trade secrecy for example, but then someone reverse engineers your product and chooses to patent, it could in principle be asserted against you, You may already have the product in the market pre-dating their filing but since you kept it secret, you did not create a precedent according to the patent system. The logic of this is that the patent system was created to make a bargain of publishing knowledge in return for limited monopoly. By keeping a secret, you have opted out of that bargain and left it to be claimed by others.